Need to hire new talent but only have a bare-bones recruiting budget? Here is a checklist of low- and no-cost recruiting ideas that work in a strong economy, but are especially appropriate when money is tight. 1. Recruit at professional events. 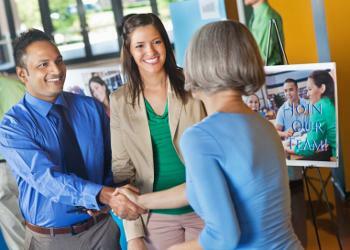 Turn your employees into recruiters when they attend trade shows, awards dinners and seminars. Employees can easily approach potential candidates as peers, and their time and travel expenses are already covered by their own department’s budgets. Task each employee with bringing back the names of three outstanding recruits among fellow attendees. Also, en­­cour­­age your organization’s executives and superstars to speak at these events to improve your overall employment brand. Good article – thanks for sharing! Employees can be even more powerful recruiters if they’ve drunk your brand KoolAid and know the company’s purpose – and their purpose in helping the organization move forward. A strong, connected internal brand makes recruiting AND retention exponentially stronger… and that also benefits your bottom line!